A long-awaited peace deal has been signed in north-west Uganda. Twenty-three years after Idi Amin was toppled from power, hundreds of his former soldiers are due to end their life as rebels at a signing ceremony in the town of Yumbe. When Amin's troops retreated in 1979, thousands fled across the border into southern Sudan. Some joined a rebel group, the Uganda National Rescue Front (UNRF). While over 1,000 made peace after President Yoweri Museveni came to power in 1986, it is only now that the remainder, known as UNRF 2, are making peace with the government. Tuesday's peace deal between the Ugandan Government and the Uganda National Rescue Front 2 rebels ends more than five years of negotiations between the two sides. At a ceremony in Yumbe, in the north-west of the country, the leader of the rebels, Major General Ali Bamuze, and Uganda's Internal Affairs Minister Erya Kategaya signed the deal, in the presence of Mr Museveni. Almost 2,000 UNRF 2 rebels who returned from bases in southern Sudan in April this year are now due to lose their rebel tag. 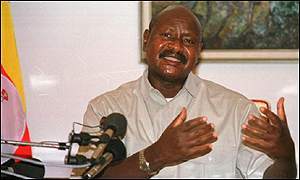 In recent months the rebels have been calling for conditions that the Ugandan Government could not accept - for instance the absorption of all rebels into the Ugandan army, and at least one ministerial post. In the peace deal that has finally been reached about 700 of the rebels will be integrated into the Ugandan army while the remainder will be given resettlement packages, including cash. Although it is not known how much each former rebel will receive, the total cost of the peace deal for the Ugandan Government is over four billion shillings (more than $2m). Following Tuesday's ceremony many of the rebels who are not absorbed into the Ugandan army will start a completely new life in the north-west of Uganda, swapping their guns for agricultural tools as they become tobacco farmers. The British American Tobacco Company has stated that it is willing to assist those who wish to go into tobacco farming in the West Nile region, the country's main tobacco growing area. This is not the first time that the Ugandan Government has brought on board people who have opposed it. Take Moses Ali. He served in Amin's army before fleeing to southern Sudan and becoming a rebel leader. But after turning his back on rebel life in 1986 Mr Ali is now Uganda's Minister for Disaster Preparedness. While the UNRF 2 rebels have not been a serious destabilising threat in recent years it is hoped another rebel group which has terrorised northern Uganda for 16 years will take a cue from Tuesday's ceremony. But whether Joseph Kony's Lords Resistance Army can follow suit and take advantage of the current rebel amnesty is the bigger question.